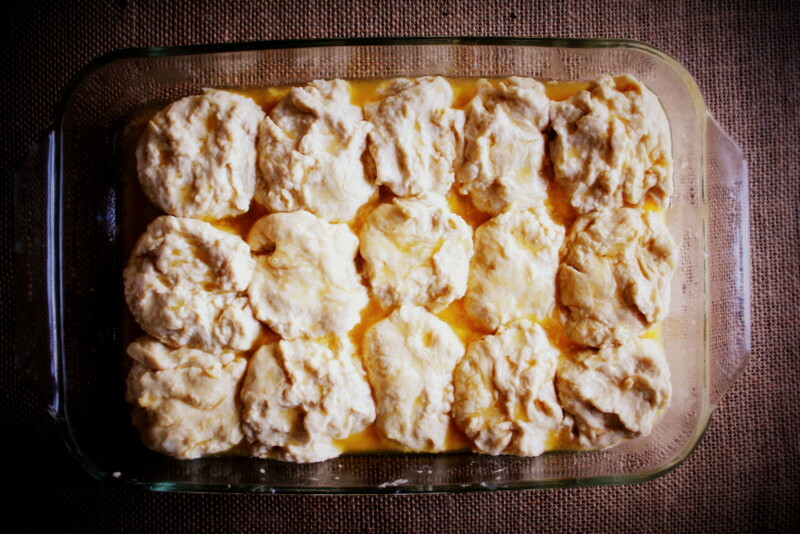 This is one of those recipes that was passed down from my mother’s best friend’s grandma. Got that? 😉 I would always ask for Robin’s (my mom’s friend) biscuits when she came to spend the weekend with us. One day, when we went down to visit Robin, my mom finally learned how to make them! Oh joyous Saturday morning breakfast from then on! 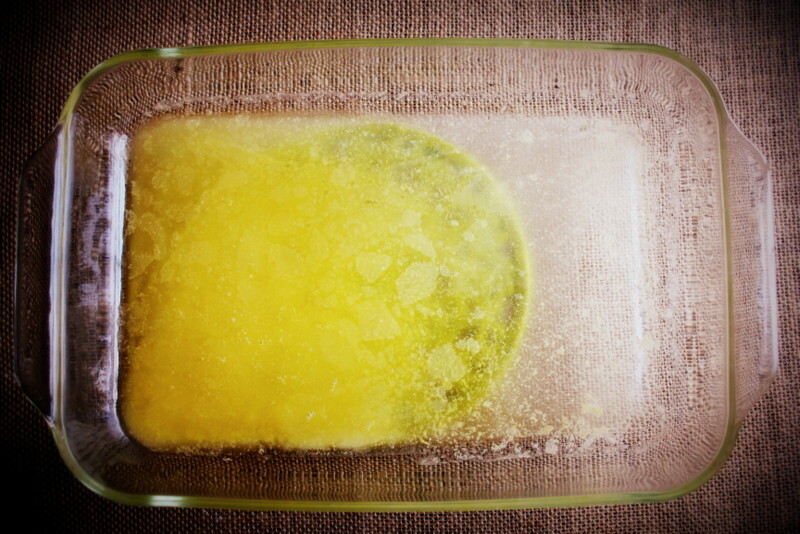 Place butter in a 13X9 pan then place the pan in the oven as it heats up to 375. But remember to take it out after about 5 minutes, it’s just so the butter can melt. Set the pan to the side. 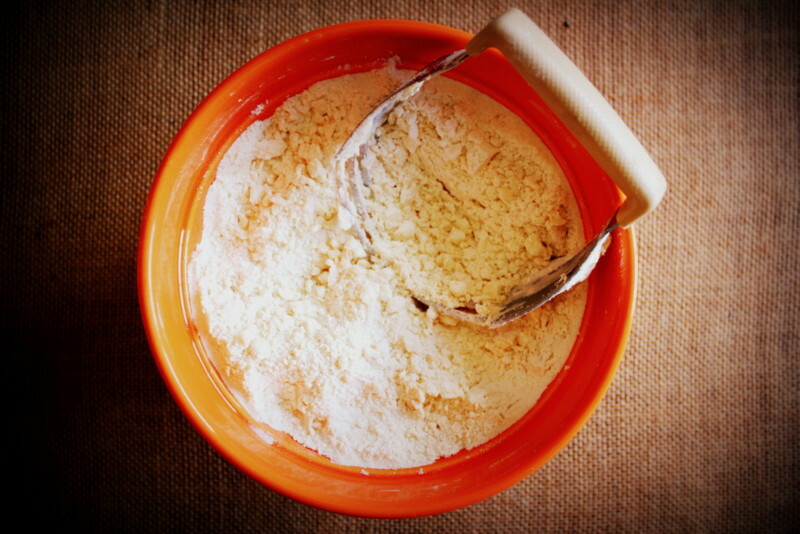 Now, you can use a self rising flour, but I don’t have any. It is very easy to make your own, which is what I did in this recipe. 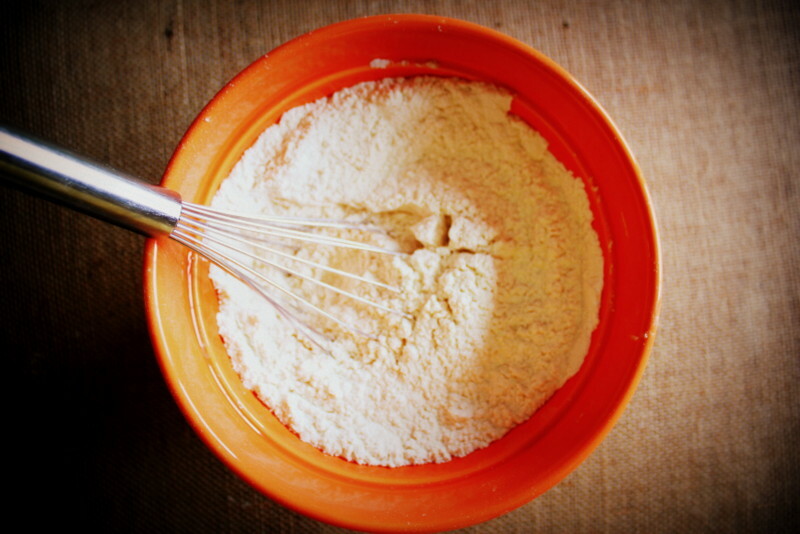 Mix your flour, baking powder, salt, and sugar together. 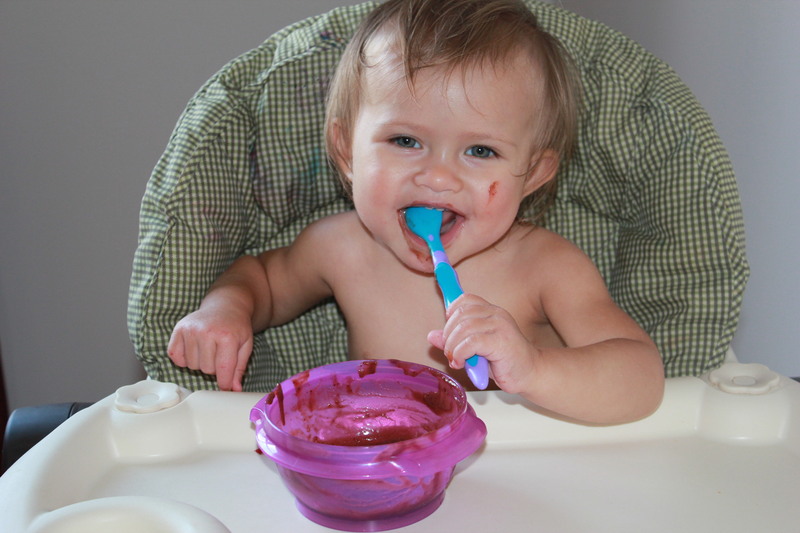 Next, what you will need is a pastry cutter, or fork and knife if you don’t have one. 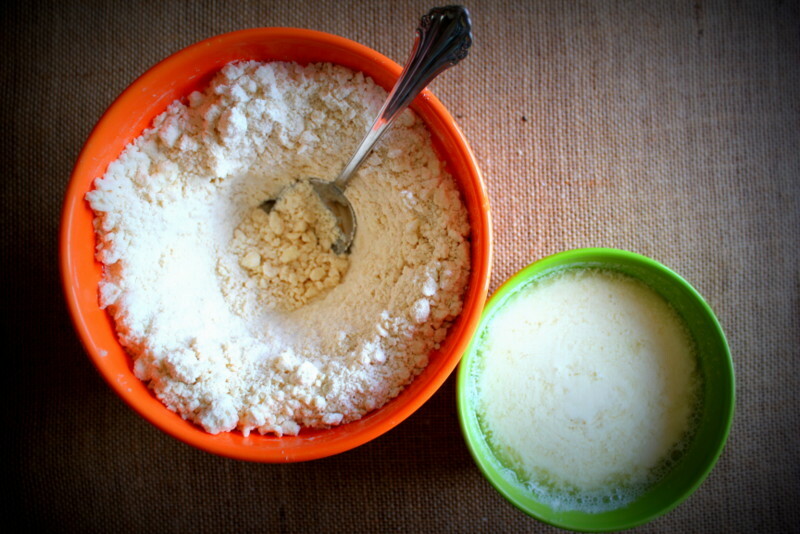 Cut the Crisco into the flour mixture. Lumps are OKAY! 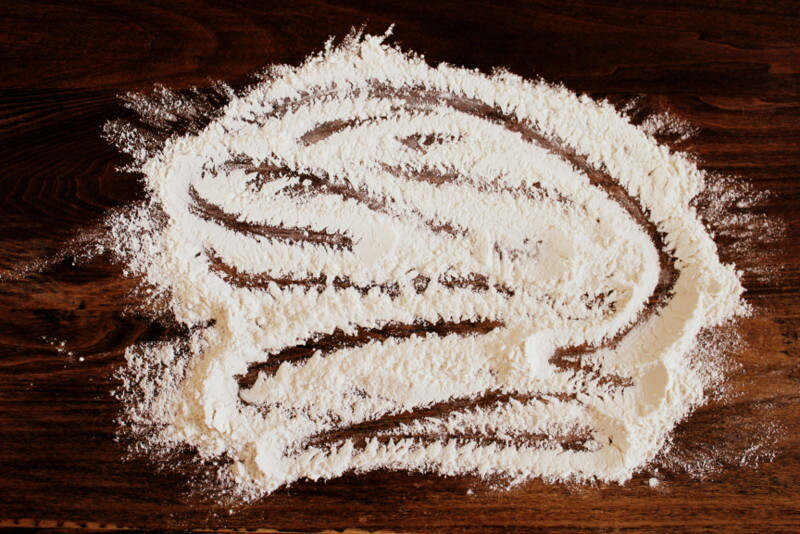 Just make sure you get to the very bottom of the flour mixture as well. 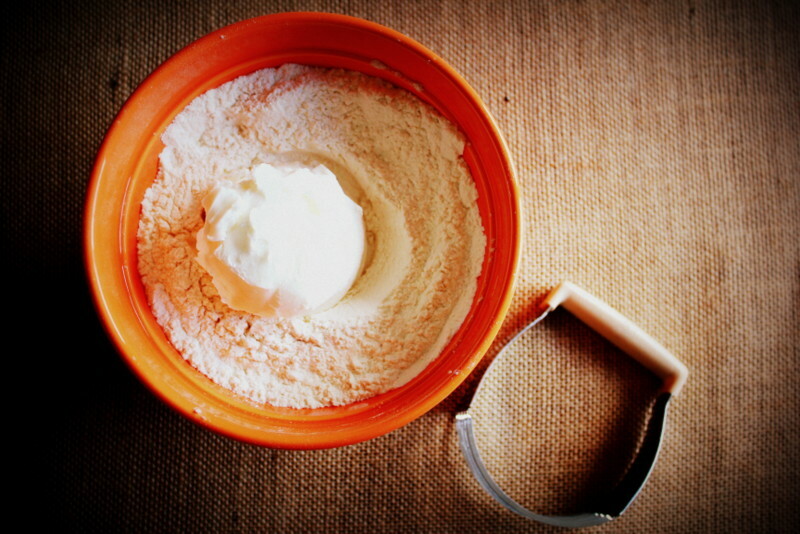 Make a “well” in the center of your flour mixture. 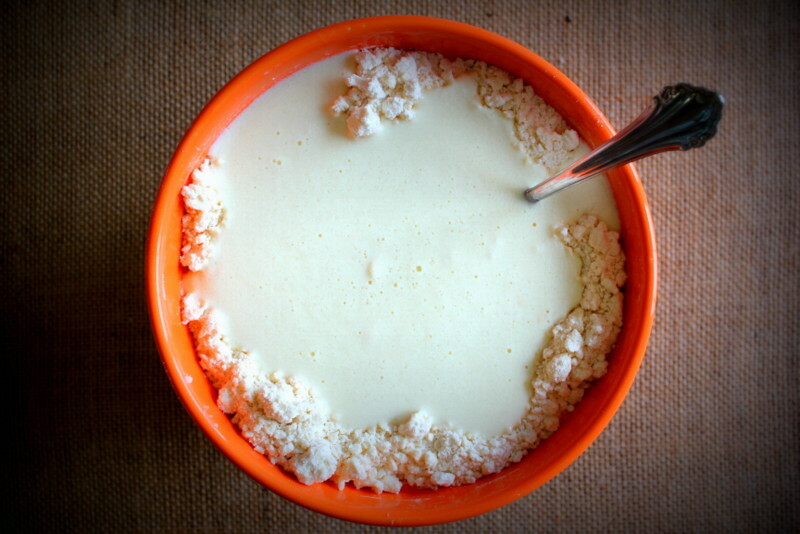 Pour your “buttermilk” into the center of the well. 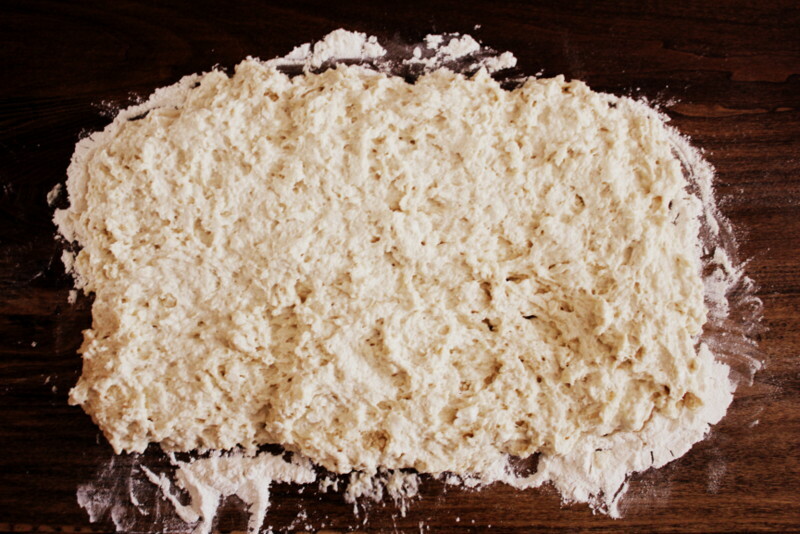 Slowly take a spoon and drag the flour from the edge through the center to the other edge. Just until the wet has cut through all the dry. 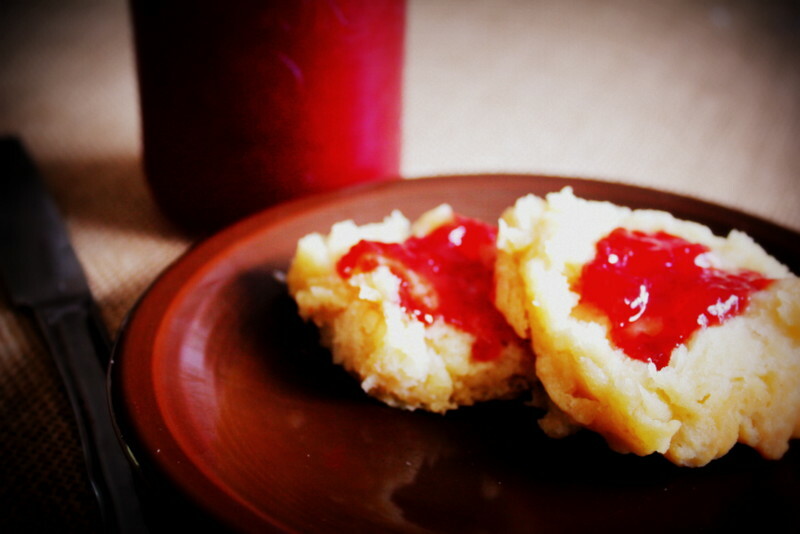 Don’t over do it so your biscuits will be fluffy! 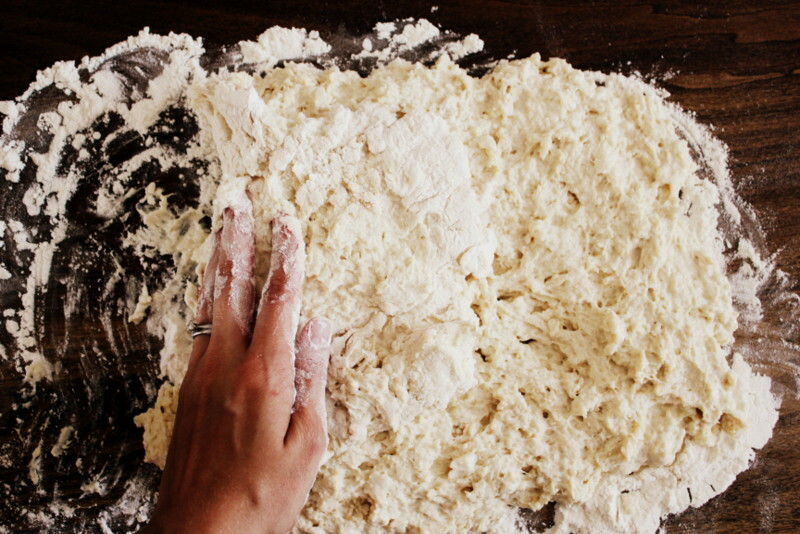 Slip your well floured hand underneath one side, flip it to the center. Repeat with other three sides. 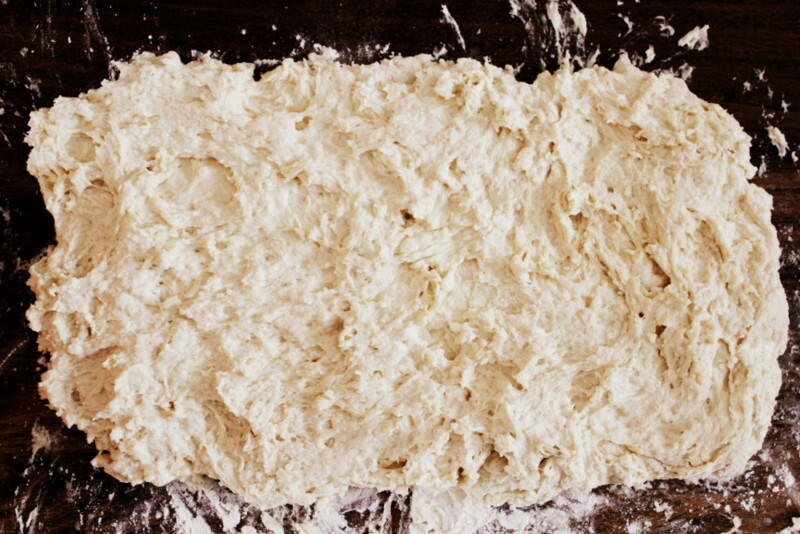 Press the dough back out into a 13×9 shape again. 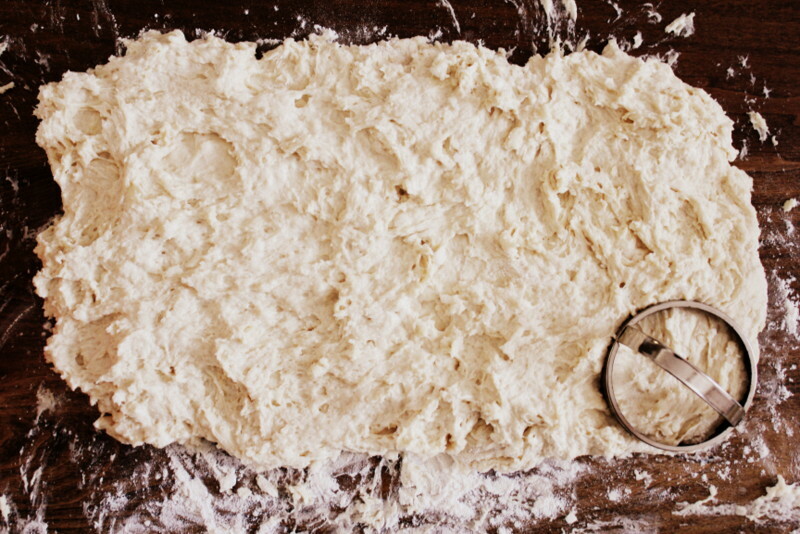 Using a biscuit cutter, or what ever circle cutter you have, use all the dough to cut 15 circles. 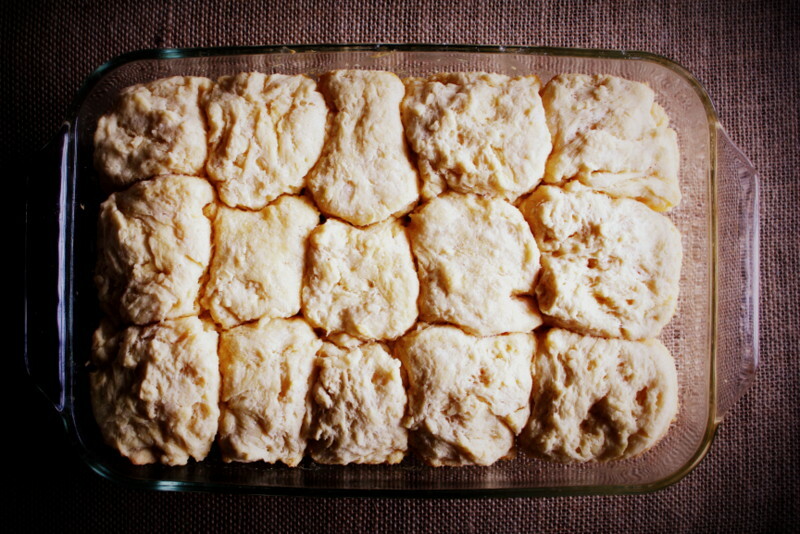 As you are placing your cut biscuits into the melted butter pan, flip them in the butter to coat the top and bottom. Bake them in the 375degree oven for 15 minutes, rotate the pan and bake them for an additional 8-11 minutes. Just watch them to make sure they won’t burn. Hope you enjoy them as much as we do! Makes breakfast for dinner amazing!!!! 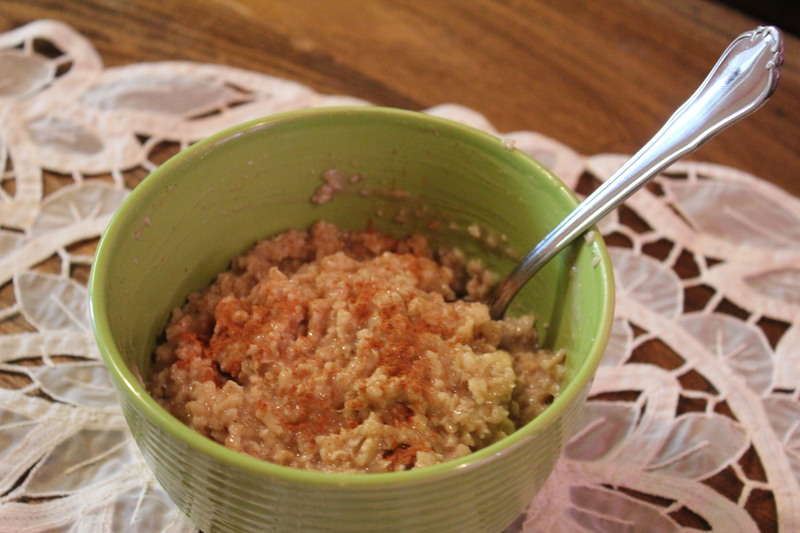 This is my first day at being 100% vegan, and what better way to start it out than with some yummy oatmeal? My daughter’s pediatrician recommended I watch Sugar the Bitter Truth on YouTube several months ago. 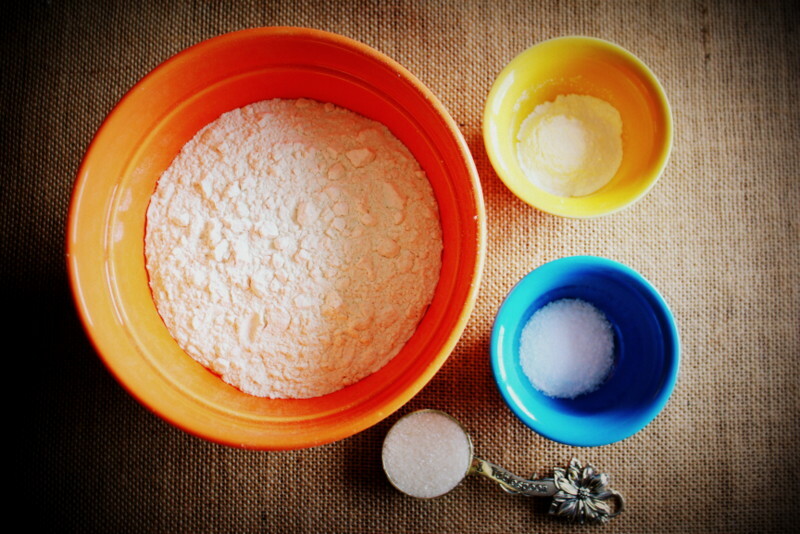 We all know sugar in large quantities is bad, but sugar in small amounts is not the best either. And for anyone who knows me on a personal level can tell you I have a HUGE sweet tooth! It can be so bad, that when there are “blackies” (my family’s recipe for triple chocolate brownies, so chocolatey you can’t just call them brownies) I will literally get mean if you try to take away my 2nd…or 3rd…or, okay, I’m just addicted to sugar. I have never been over weight, and have usually always had a “nice” figure, but I have this cushy layer of sugah-fat that likes to cover my body. So what better way to start being (mostly) sugar-free than to kick it off with my vegan diet? Make a complete life style change for the better, to teach my child and hopefully future children. 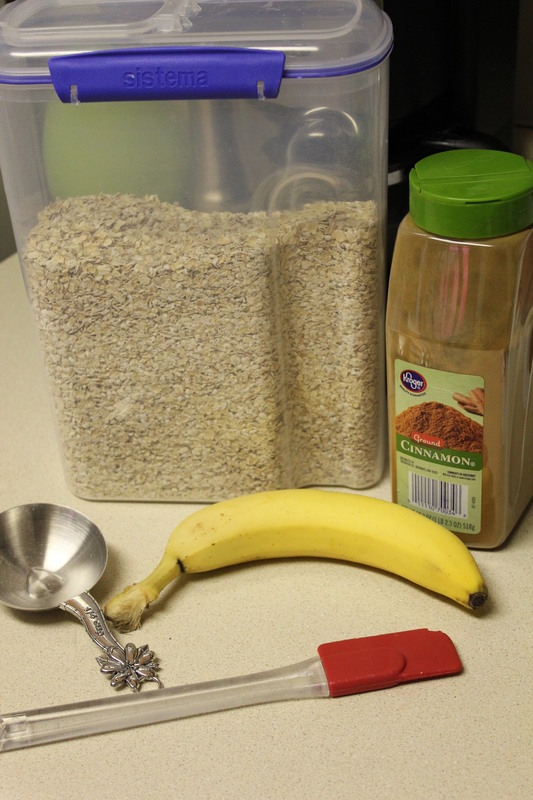 Ingredients: 1 banana, 3/4 cup raw quick oats, 1 1/4 cups water, 1/16 tsp + more to sprinkle on top of cinnamon. Add your cinnamon and mix it together. Stir in your oats and enjoy! 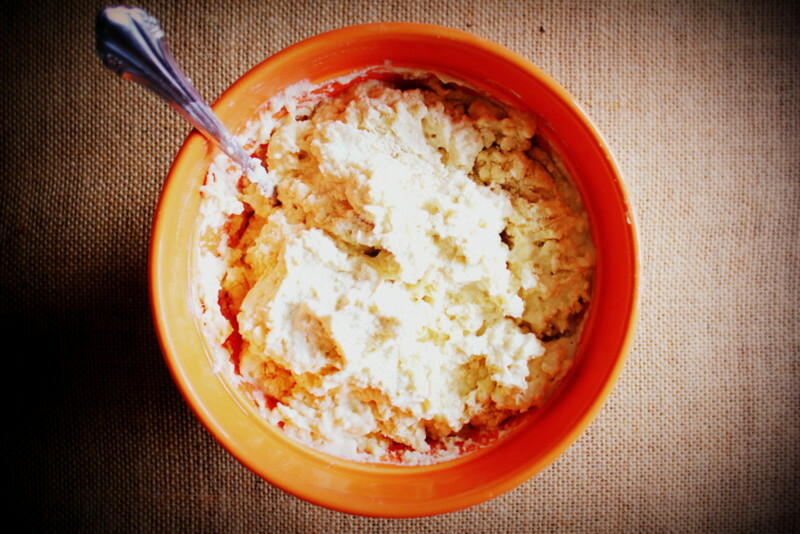 Super easy and yummy! You could also add in blueberries, or strawberries, your favorite nuts, coconut flakes, or even some chocolate chips if you want to make it a bit fun! Oh my goodness. That is all my brain tells me, as I sit here eating the very thing I am blogging about. I couldn’t wait to share this new recipe. The wonderful thing about this is there is no cooking or baking skills required. You only need to know how to slice up fruit (and it doesn’t have to be pretty) and how to work a blender. 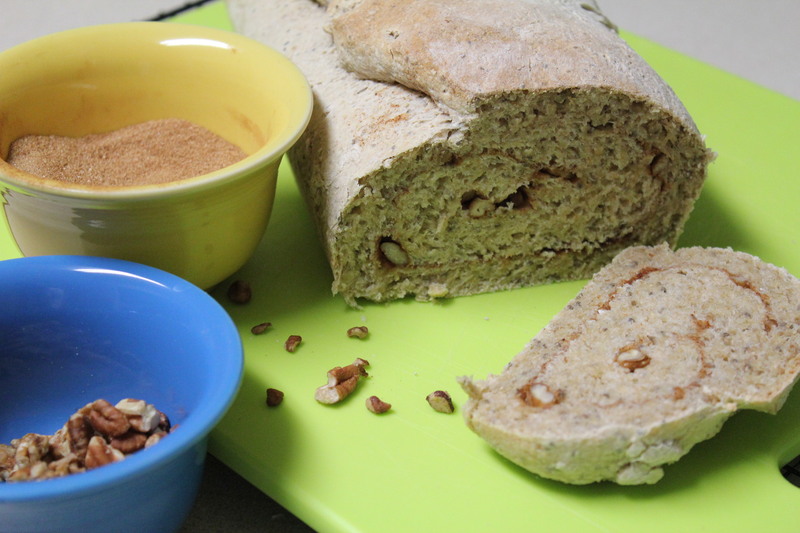 I was actually making this for my little one since she has so many food allergies it is challenging to feed her a wholesome treat for those in-between meals. She wasn’t interested in trying because all she had on her brain was “mmk” or in adult language “milk.” So darn, I couldn’t let this go to waste, so I am eating it as we speak. It is so good!!!! Caroline is going to be disappointed in what she missed out on. Chocolate Cherry Ice “Cream” isn’t really cream at all. This is a 100% vegan or plant based treat. So ideally you could eat this as breakfast and not feel guilty at all! 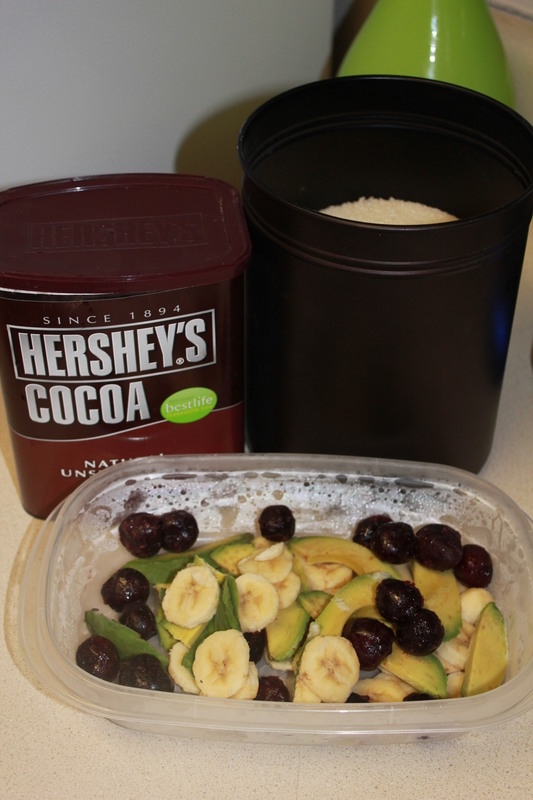 Place all fruits in a food processor along with 1 Tbs of coco powder, and I did use 1 1/2 Tbs sugar – you might be able to leave that out – and I added a few Tbs of water for texture, but you could also add any type of plant milk or if you wish any other kind of milk. Blend until smooth! And serve! Ahhhh! So yummy! I just put a double batch of fruit to freeze for an after dinner dessert. She eventually came around. I mean, how can you refuse chocolate?!?! 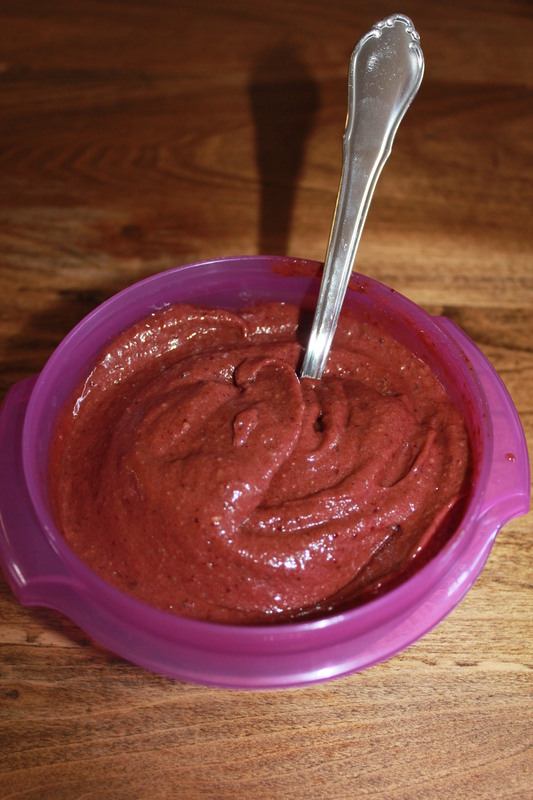 Place frozen prepared fruit into a food processor with coco powder and sugar. 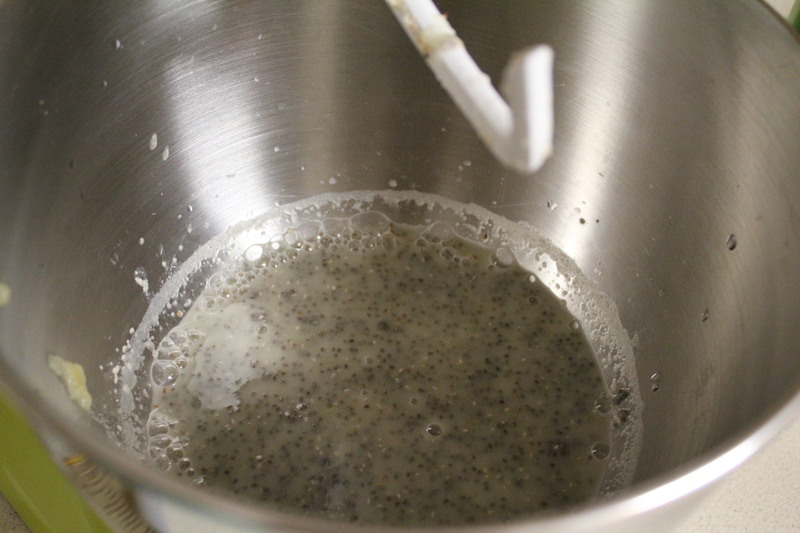 Blend and add your choice of liquid until desired consistency. It has been awhile since I have posted anything, and that is mostly due to my major cleaning and organizing of the house. It was a long time over due, for sure! I have been trying this recipe in my head for the past few weeks, and have finally decided to try it out. 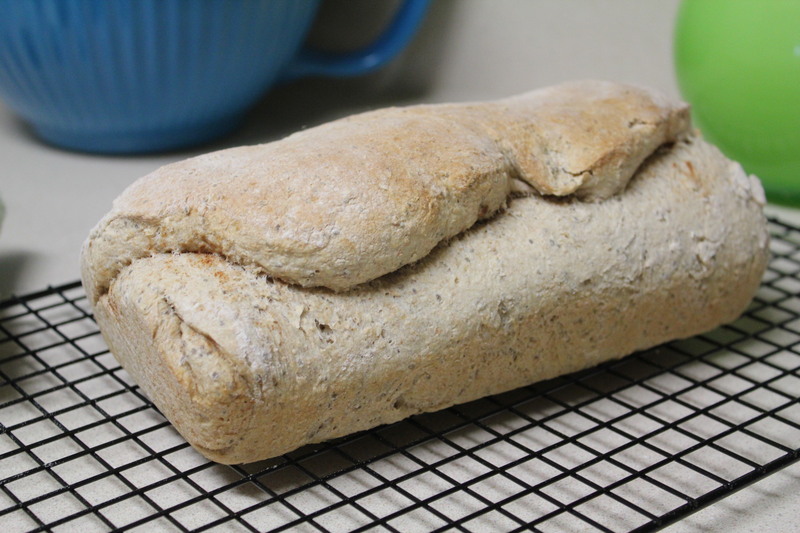 I love bread in almost any shape and form, and since I make all bread in our household, I end up slicing a piece and having it for breakfast with a slab of butter…this repeated over time is not the healthiest way to go. 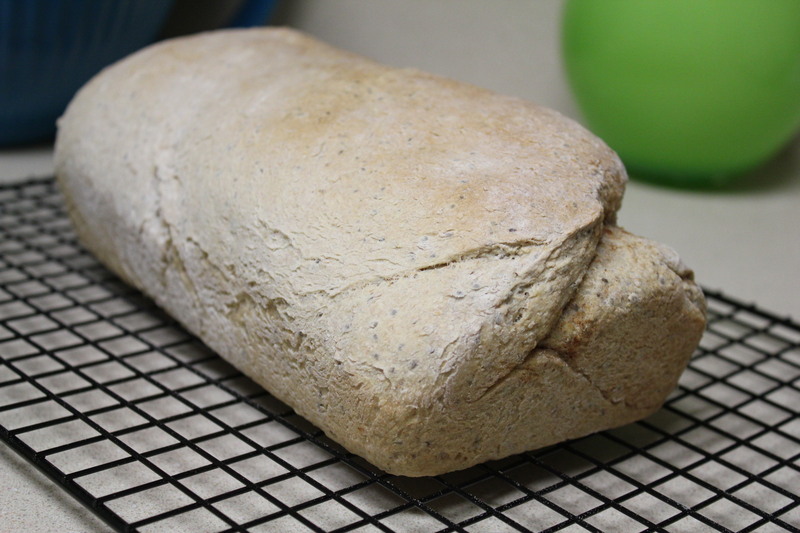 So, I set out to make a breakfast bread. Yes, I realize there is sugar in it, but hey! What is breakfast now days if it isn’t made with some sugar?!? 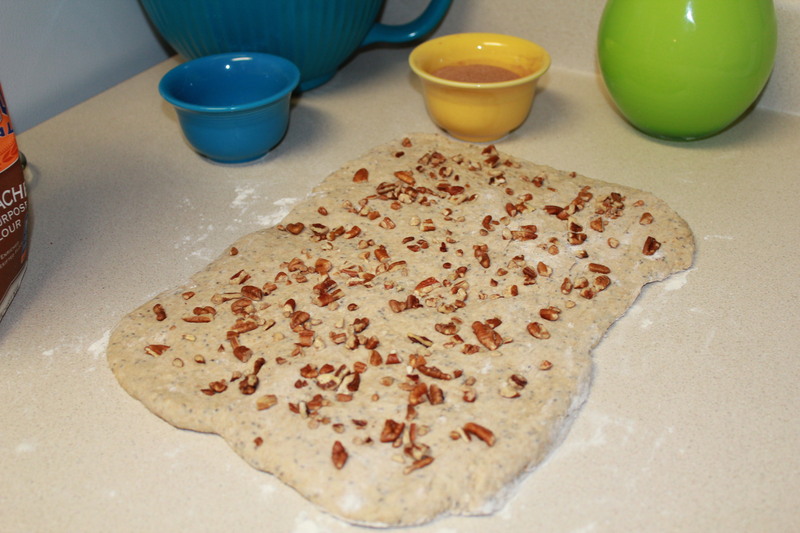 Might as well make it homemade without preservatives and chemicals, and make it mostly whole grains! 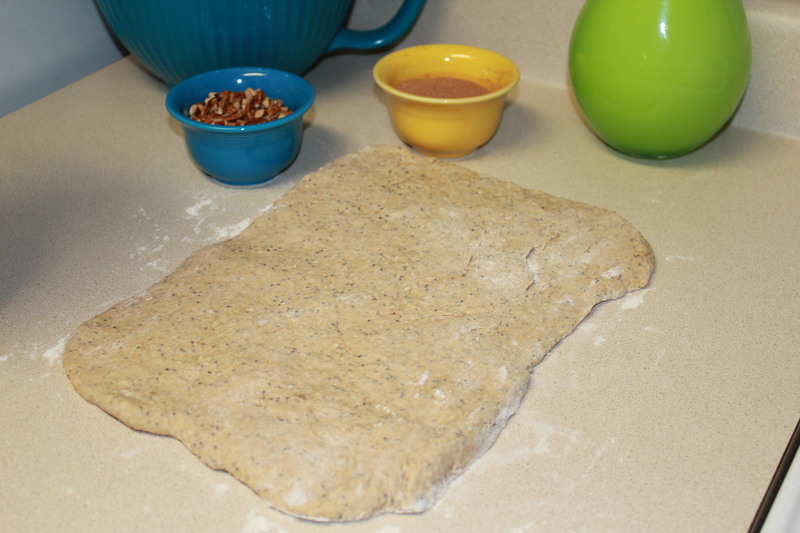 Ingredients: honey, active dry yeast, salt, unsweetened apple sauce, warm water, chia seeds, unbleached white whole grain stone ground flour, unbleached AP flour, rolled oats, cinnamon sugar, chopped pecans (or nut of choice). 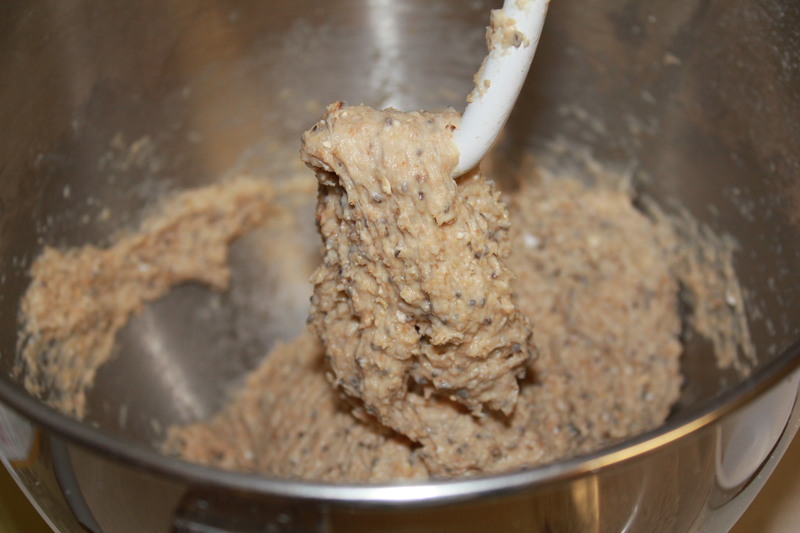 Mix 1/4 cup honey, 3/4 Tbs yeast, 1 1/6 cup luke warm water, 2 Tbs warm apple sauce, 2 Tbs Chia Seeds (optional), 1 1/4 tsp salt. Mix for 3 minutes. 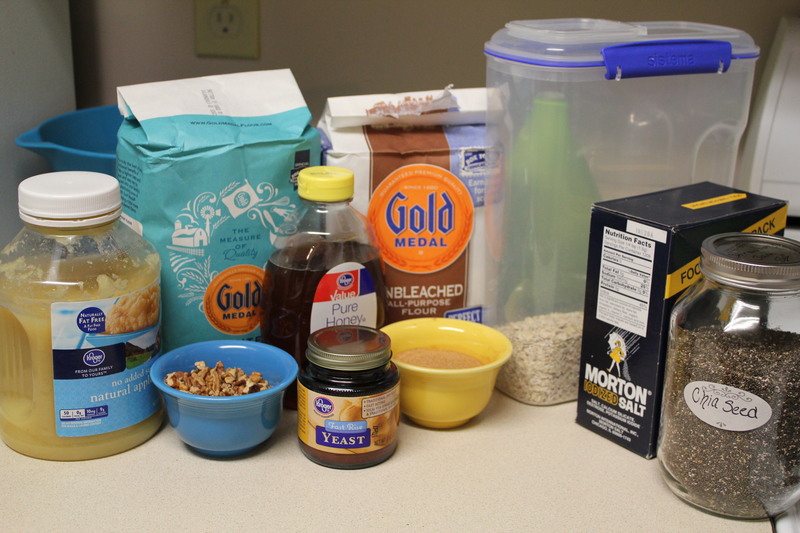 Add 1 cup white flour, 1 1/4 cup whole wheat, 3/4 cup pureed oats, 1/2 cup whole oats. Mix until well combined. 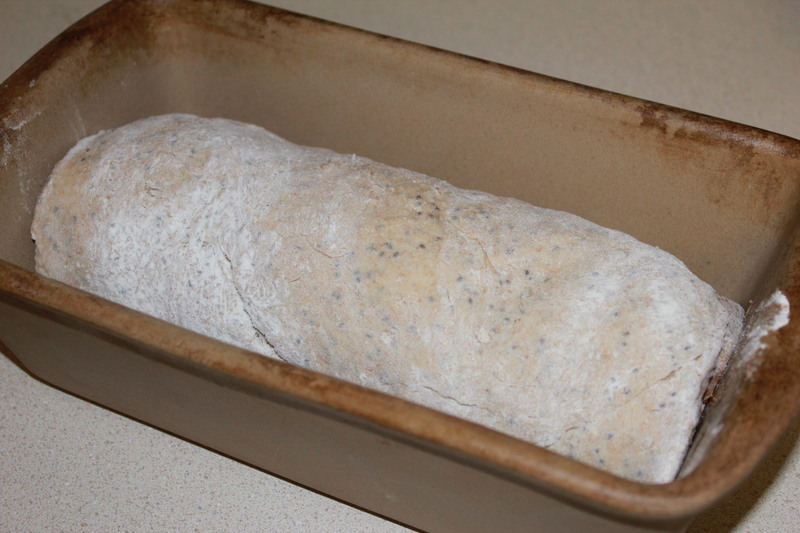 Cover with plastic wrap or a wet tea towel and let rise for 45min to an hour. 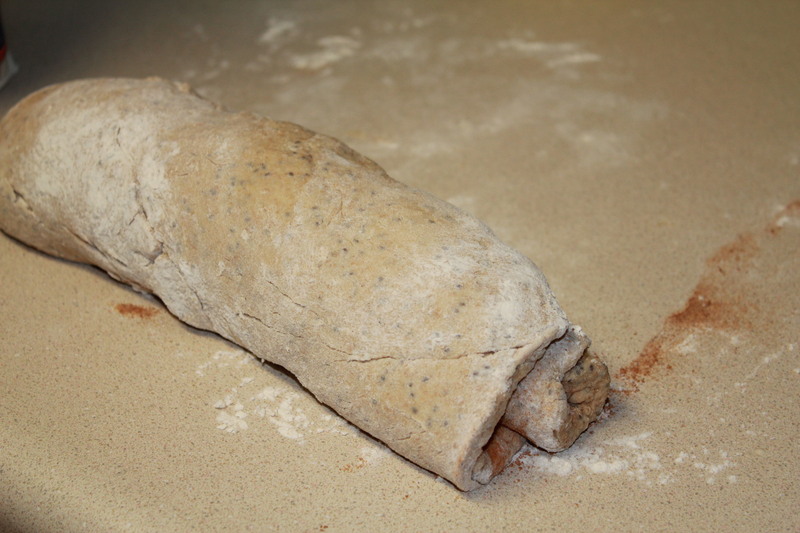 On a well floured surface, press dough out into a rectangle. Now here is the fun part. You can customize this however you want! It’s your time to shine and to make it something you can personally brag about =) But here is what I did. 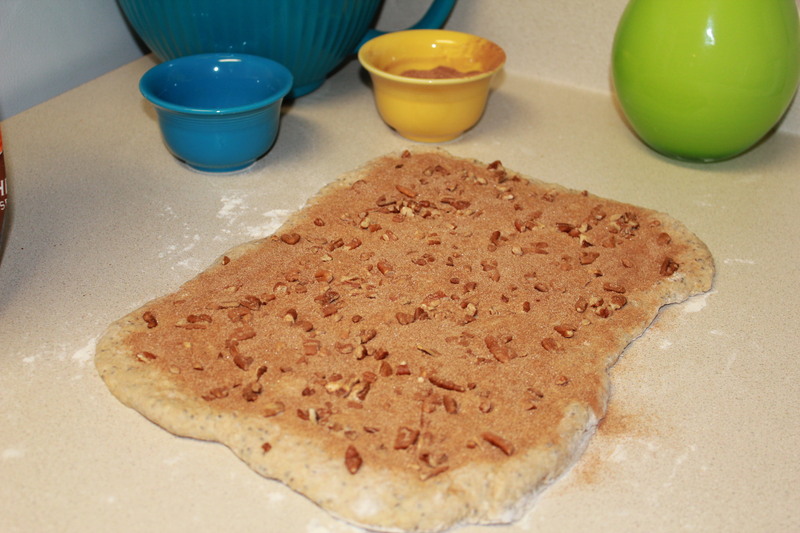 Take your chopped pecans (or your choice of nut), and press them into the dough. 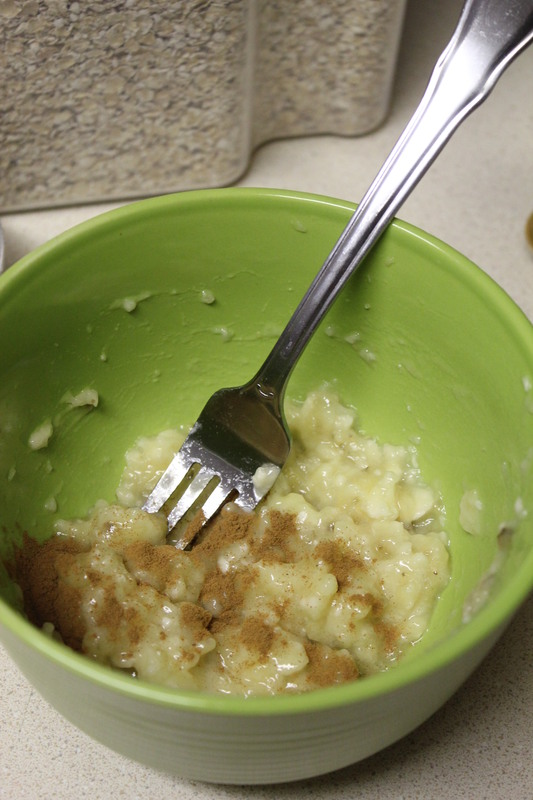 Next, sprinkle the cinnamon sugar (ratio to make your own is 1:3 cinnamon to sugar). However much or little you want. Place it into a greased pan and let rise for 40 minutes. Preheat oven to 350 degrees while 15 minutes still left of rising. This is after it has risen. 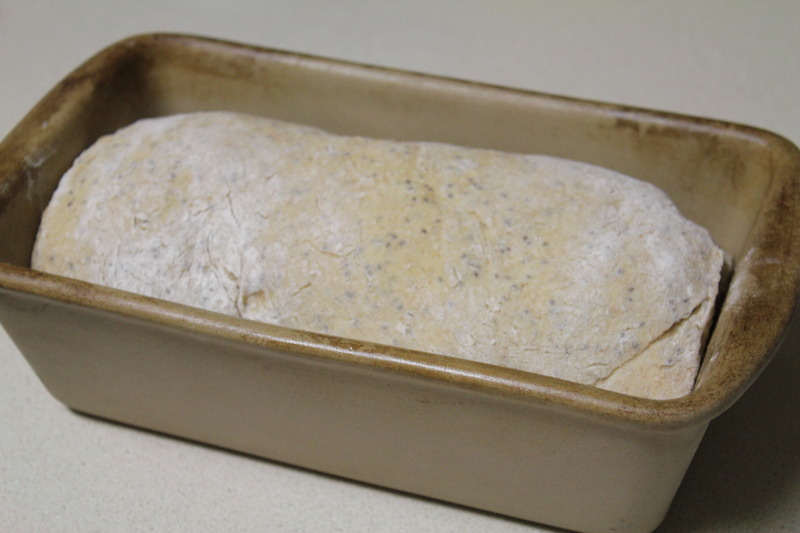 Place in oven and bake for 35-40 minutes. Once it has cooled, dig in! It’s really yummy!!! No butter needed. I hope you enjoy this! Let me know what you think and/or alterations you did to improve the taste and to make it uniquely yours! Andrew isn’t much of a breakfast eater, and I get tired of the whole cereal rout. Typically, Andrew doesn’t even eat breakfast, but then he is STARVING by around 10am, so he eats his lunch. Well, that is okay, but then he has no lunch to eat and has to work until 5, then commute 40mins home. He is one starving boy by that time. So, I had a dilemma: how to keep Andrew from starving so he doesn’t eat everything and leave nothing for dinner when he gets home. Duh! A smoothie! Andrew and I both love fruit, and always loved going to Smoothie King on our college campus when we could afford it. It is light, healthy, and fits right in with our whole foods diet. 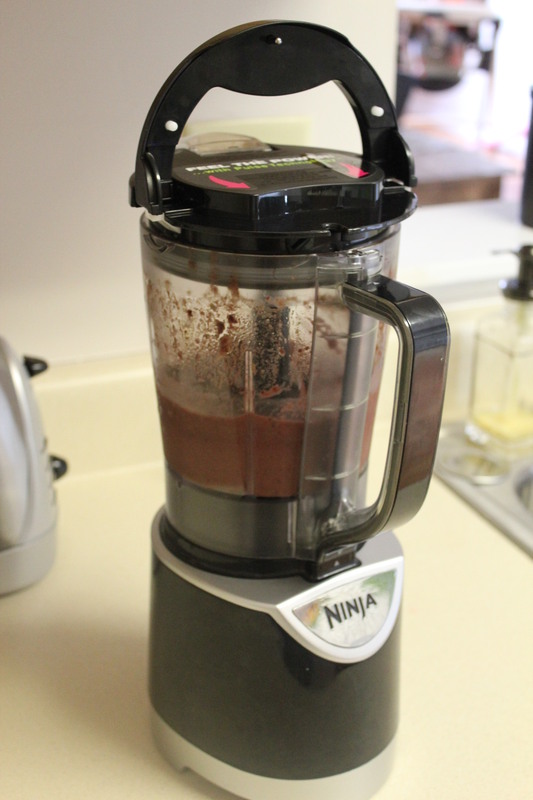 There are MANY variations of smoothies, and it is honestly just a “whatever you feel like” kind of dish, but here is one the both of us love. On the plus side, even though it tastes creamy, it’s dairy free! (at least the way I make it). I use Almond milk, as a personal preference, but it does have more calcium than milk and is easier to digest! 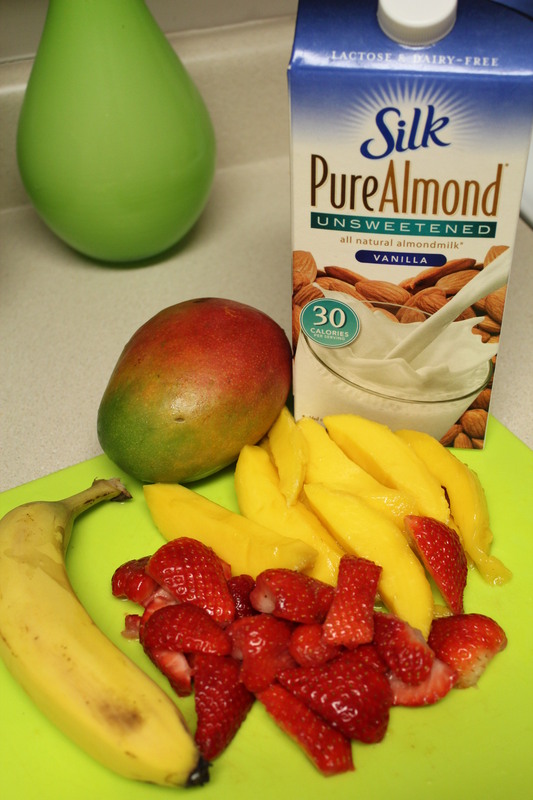 For this smoothie, I use 1 mango, about 2 handfuls of cut up strawberries, I only use half a banana, and about 1/2 cup almond milk (or regular milk if you wish). I personally don’t put any sugar in it, but if I were I would probably put 1-2Tbs depending on how sweet you want it. 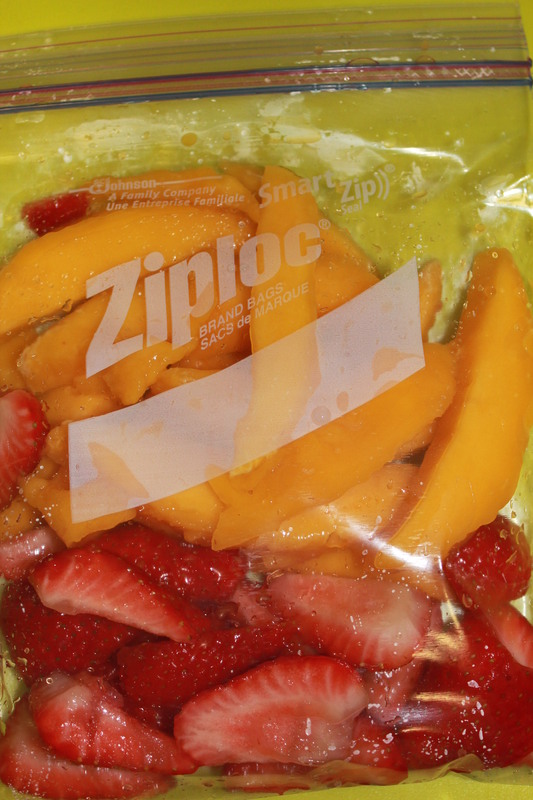 Cut up the mango, and strawberries (the night before) and place them in a freezer baggie. Put them in the freezer and you are good to go until the morning! Before you have to go to work, school, etc. 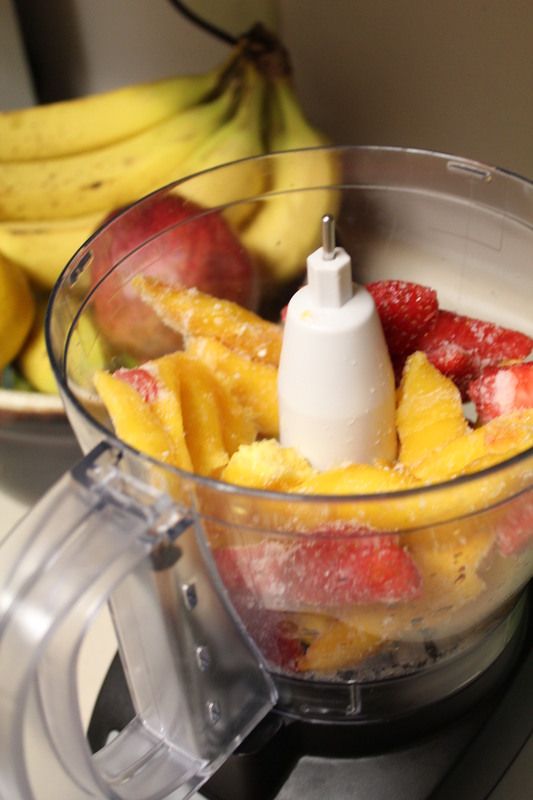 Take the mango and strawberries out of the freezer and place them in the blender/food processor (it would probably be easier if I had a blender since that is what they do, but I don’t so I make it work). 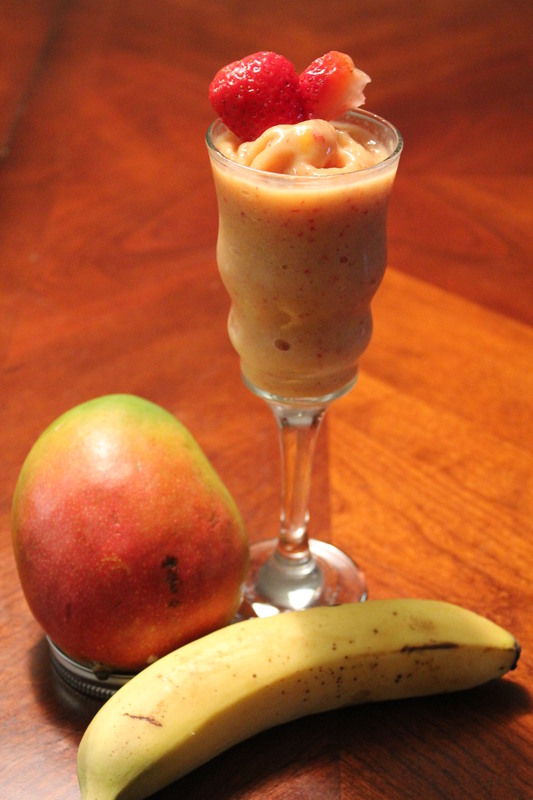 You will have to break up the mango and strawberries by hand to make it easier on the blender. Next add the banana. Why I usually only do half a banana, in my opinion, it can usually over power the rest of the fruits. 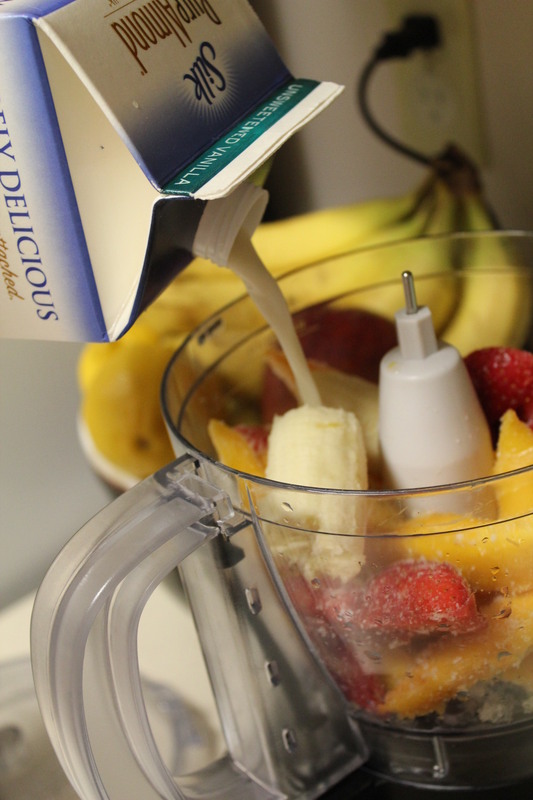 By only putting in half, you still taste it, but it isn’t only a banana smoothie with sub-fruits! Next, add in the almond milk. 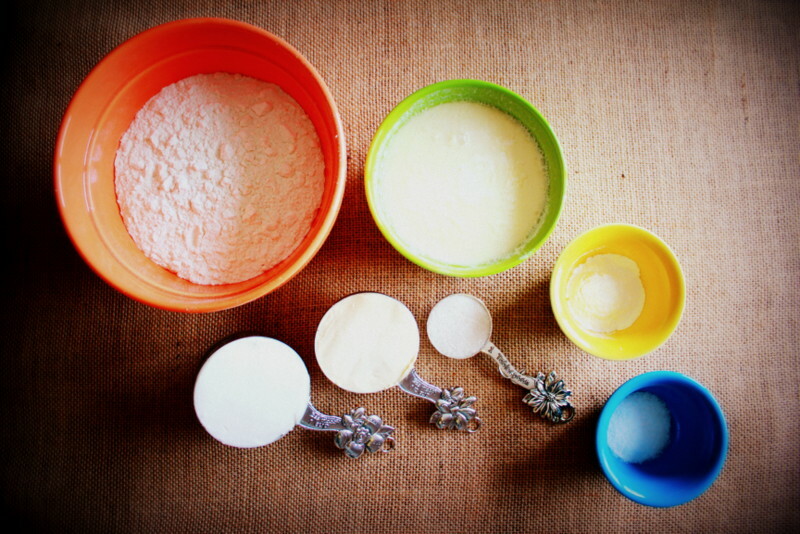 I would start with half a cup and then add more to get the texture you desire. Then you are done! Serve and be happy and healthy! This makes approximately ‘3’ cup servings so about 24oz. This is great for even babies (over 9 months considering the almond milk, also be careful because strawberries can be a serious allergen). Our daughter loves these. Especially when she is teething. The cold feels good on her gums! Night before, prepare mango and strawberries and place them in a freezer bag then into the freezer. 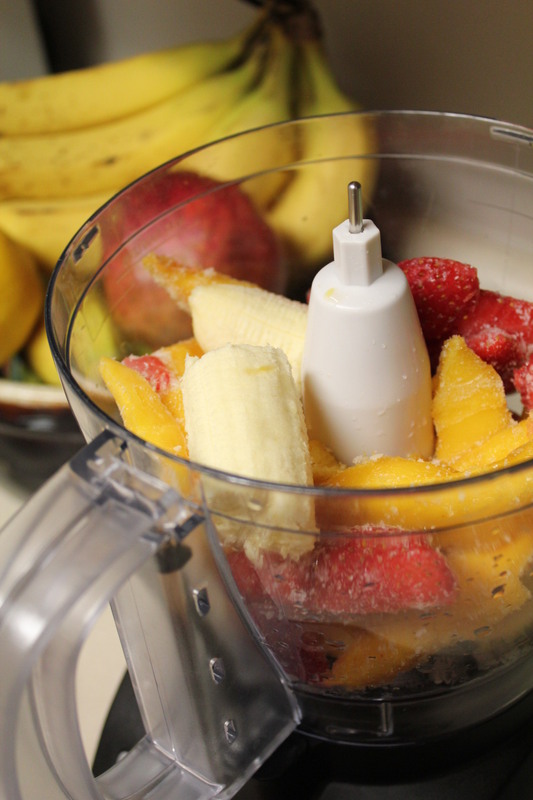 In the morning, take out the frozen fruit, break apart with hands and place into the blender. 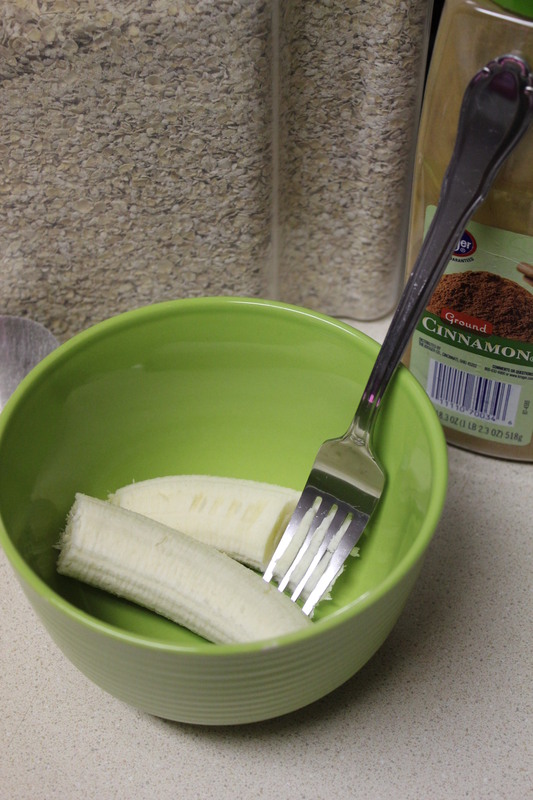 Add banana, and ½ cup almond milk (and sugar if desired) and blend until smooth. Add almond milk until desired consistency.